In the first of this series we looked at How to Photograph Trees (click on the link if you missed it). 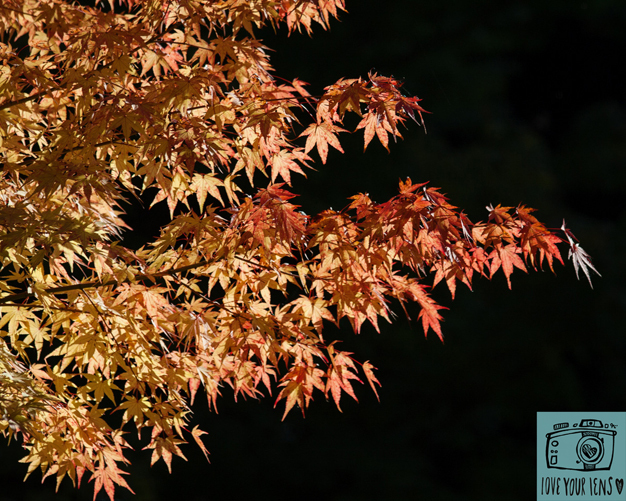 This time we’re going to concentrate on how to photograph Autumn leaves and capture their many glorious colours, shapes and textures. Fujifilm X10. Shutter speed 1/320. f/3.6. ISO 250. Cropped square. Well of course it is as without light we wouldn’t have photography. However, to move from snapshots to great photographs, we need to spot instances when the light is doing something special, to transform the mundane into the magical. Autumn leaves look spectacular when they are back lit as in the shot above. As I moved I saw how the sun flared through the gaps in the leaves and I positioned myself in the right place to capture it. 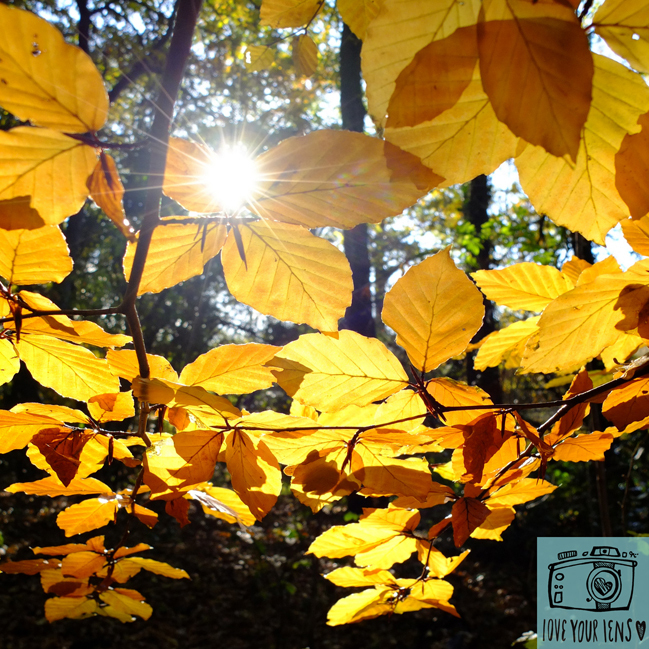 Look for leaves that are caught in a shaft of sunlight, ideally the golden light that occurs when the sun is low in the sky. In the shot below the trees and foliage were so dark behind the acer leaves that the background is almost solid black. Canon 350D. 70-300mm lens. 1/800. f/5. ISO 100. Contrast slightly enhanced post production. If you can go out just after a rain shower, you’ll find that colours look deeper and richer. Avoid shooting in direct, overhead sunlight as it’s too strong and contrasty and look instead for shade. Autumn leaves have truly beautiful textures and patterns and stunning colours and this is what you should be seeking to show off to their best in your images. 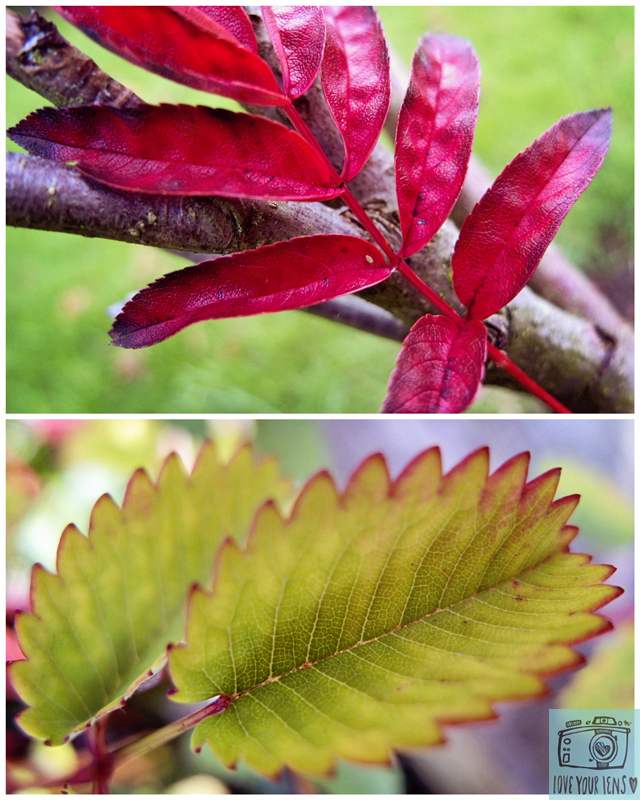 Get up close and exclude unwanted distractions, making the leaves the hero of the shot. Use a wide aperture (a low number like f/2.8 or lower) to blur out the background. Be mindful of what’s in the background, even when it’s blurred as strong colours can distract from the main subject. Leaves look good when shot on a diagonal, rather than straight. 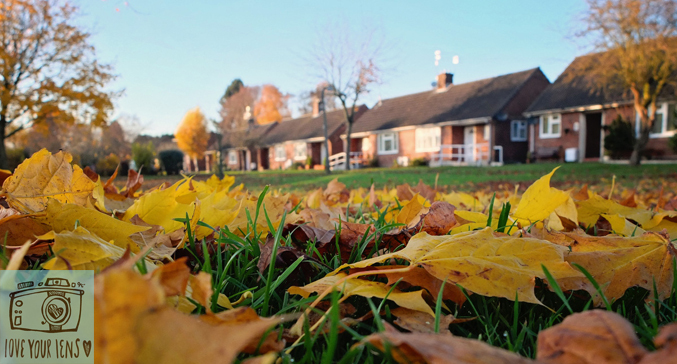 Avoid cliche Autumn shots and look for something different. 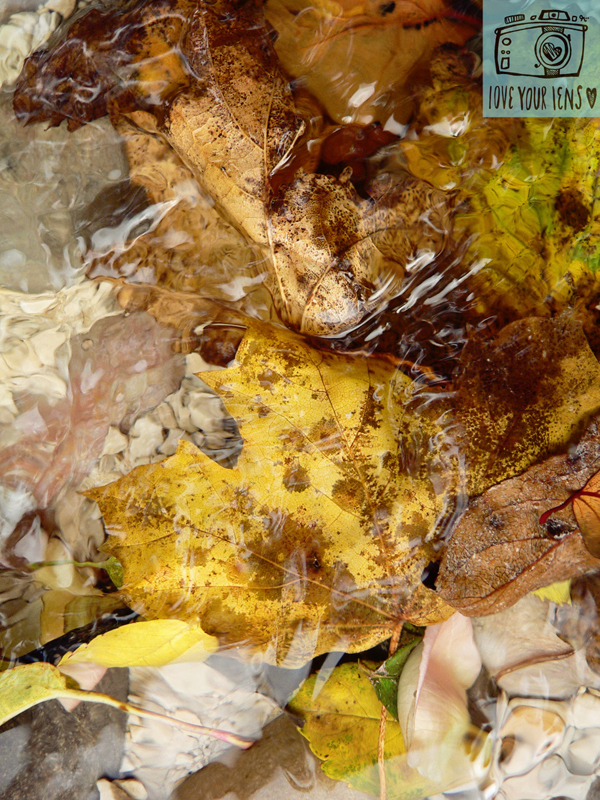 These leaves had fallen into a narrow channel in a water feature and I loved the way the water moved across them, deforming the shapes and enhancing the colours. Panasonic DMC-FZ20 1/125. f/2.8. ISO 100. Try shooting at ground level if you don’t mind getting damp knees. I shot this as an attempt to see what my dog sees when he snuffles through leaves! Focus somewhere in the foreground, on a particular leaf if you can. These last two shots were taken using a 50mm f/1.4 prime lens and I was playing around with getting really soft focus backgrounds. I really liked the backgrounds and cropped the shots to purposely only include out of focus, abstract patterns. They might not be everyone’s cup of tea but I loved them. Canon 5D mk II. Canon 50mm f/1.4 prime lens. For both shots: 1/640, f/1.4, ISO 160. You can’t beat looking at other photographers’ work to develop your own creative eye and a good starting place is Pinterest. There are of course, photography magazines, websites, forums, real books, e-books… whatever format you prefer. And to finish off, a word of warning: don’t be tempted to over process your images. Autumn colours zing off the page anyway so there’s no need to go mad. A quick search of Pinterest for Autumn leaves left me reaching for the sunglasses. I run courses and offer one to one tuition to beginners and improvers, so if you’d like help getting to grips with your camera and live within sensible distance of Cheshire, then click on the links and take a look. 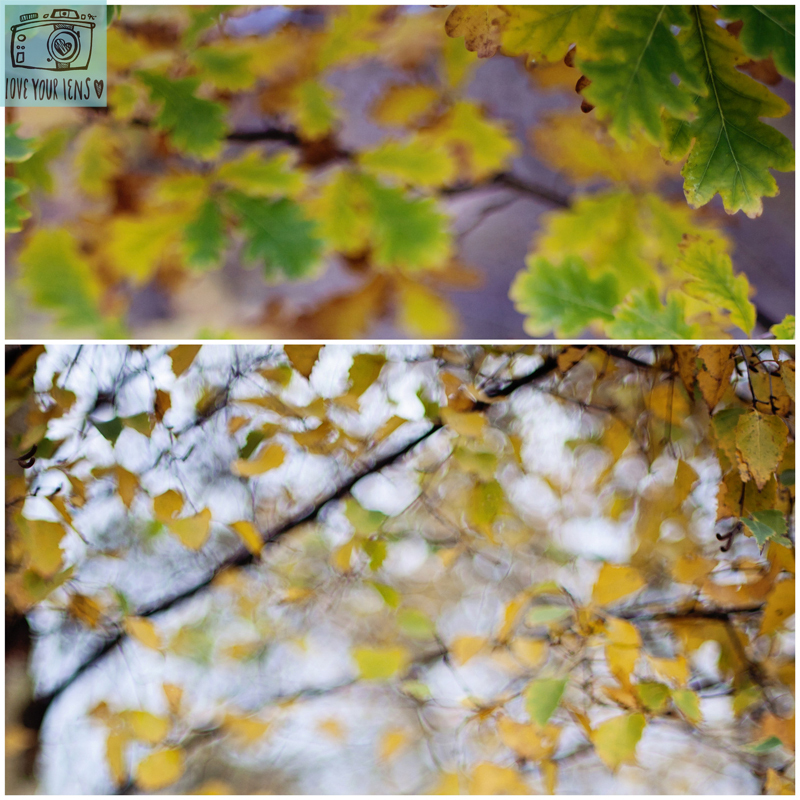 Don’t miss the next instalment – how to photograph children playing in leaves. Looking forward to getting out this autumn and playing around with my new found skills from your course. The blogs are really helpful and inspiring. 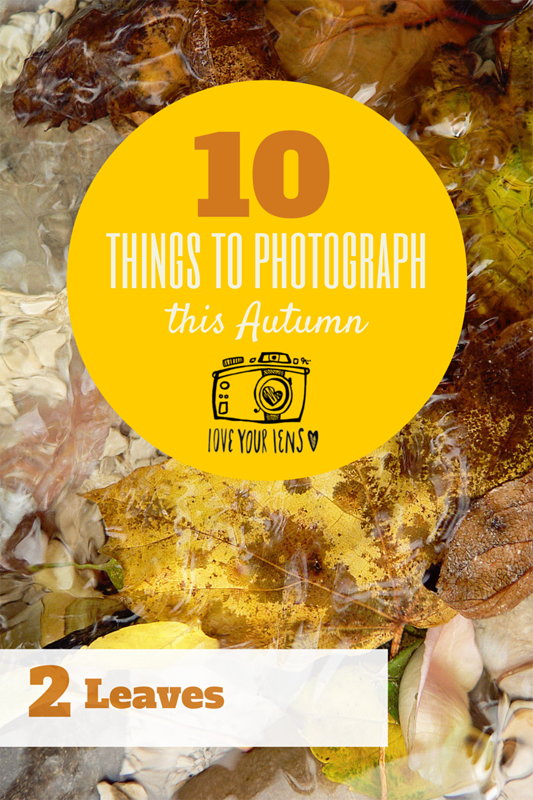 Great ideas for different Autumn shots. I wish we lived a bit closer to Cheshire as I would be signing up for a course. Can I add a word of warning when doing backlit photos as it is really dangerous to look at the sun through a camera lens. I actually damaged my eye taking photos – it was sunsets and I thought the sun was safe to look at as it was not very bright. It wasn’t! Backlit photos are great but I am now very careful and if possible I use the LiveView feature on my camera. Hi Annette, that’s really kind of you, thank you. I hope to do some online courses next year but in the meantime I hope you get lots of tips from the blog. Thanks for the reminder about not looking directly at the sun through the lens. I’m going to do a post about Autumn sunsets shortly and I’ll mention it then.